Though the speed limit remains 40 to 50 mph on US-36, the Boulder County Sheriff's Office and Town Officials encourage traffic to drive slowly and cautiously through all areas of road work. Because US-36 is a state highway, local entities are not permitted to alter the speed limit. The Sheriff's Office and Town Staff recently sent CDOT a request for speed reduction through the work zones. If approved, the reduced speed will be put into effect immediately. Thank you for helping our crews stay safe. On April 19, 1880, E. S. Lyon founded the Town of Lyons, and on April 6, 1891, the Town became incorporated. This April marks the Town's 125th year, or quasquicentennial, of incorporation. To celebrate, Town Officials are hosting a commemorative event on April 4, beginning at 4:00 p.m., at Lyons Town Hall. The events will include opening live music, tours of the Lyons Depot, speeches from Mayor O’Brien and Mayor Pro Tem Sullivan, history and poem readings, presentations of commemorative gifts, and more. A Board of Trustees meeting will follow the event, beginning at its regular time, 7:00 p.m. 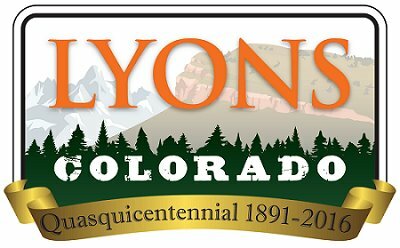 Please join us in celebrating Lyons' 125th year of incorporation on April 4, and be on the lookout for special quasquicentennial memorabilia! The next Board of Trustees meeting will be held Monday, March 21. The workshop begins at 5:30 p.m., and the meeting starts at 7:00 p.m. If you'd like to be notified via email when new agendas and packets are posted, subscribe through the Notify Me page. 1. Enter your email in the box and click "Sign In"
Boulder County residents ages 14-17 have until 4:30 pm on March 25 to apply for summer jobs with the Boulder County Youth Corps. Boulder County is also hiring adults to be leaders. The Youth Corps will hire 160 teenagers to work 30 hours per week, Monday through Thursday, from June 13 to August 3 on a variety of community service projects such as trail construction and maintenance, historic preservation, forest thinning, construction and repair of fencing, landscaping and removal of Russian olive trees and noxious weeds. Youth Corps teams will work in unincorporated Boulder County as well as in cities and towns within Boulder County. The Lyons Ecology Board is hosting a free movie and special presentation at the Farmette on Friday, March 18. The movie, the Great Divide is about the history of water rights and regulations in Colorado. The special guest, Bob Crifasi is the author of A Land Made from Water - a book that chronicles how the appropriation and development of water and riparian resources in Colorado changed the face of the Front Range—an area that was once a desert and is now an irrigated oasis suitable for the habitation and support of millions of people. Sponsored by the Town of Lyons Ecology Advisory Board. Space donated by the Lyons Farmette. The Lyons Parks and Recreation department, in conjunction with the Lyons Library, is pleased to offer a basic computer skills class for Lyon’s Active Adults 50+ at the Lyons Regional Library. This class will go over e-mail, Facebook, and internet skills, and can help you get more connected with all of the most-used Lyons Facebook pages. There is a maximum of 5 participants for this class. RSVP by March 25, by calling 303-823-8250, or email Lori LeGault at llegault@townoflyons.com. The class will be offered monthly. Stay tuned for upcoming dates! The Town of Lyons, along with the hired consultant team, will be holding public meetings for the Lyons Primary Planning Area (LPPA) Master Plan. The LPPA includes parcels that are currently outside of Town limits. As part of this planning process, the LPPA has been broken out into three small areas: the Eastern Corridor & Gateway; South St. Vrain River/County Road 69 Area; and Apple Valley. Information from past workshops will be posted to the LPPA Master Plan Page when available.